Bean based soups and stews are among my most often cooked Fall and Winter dinner time fare. They are economical and usually take very little hands on time. 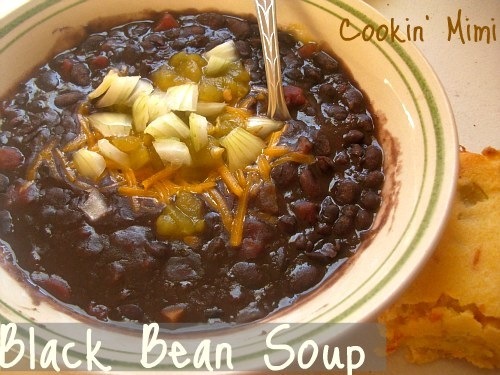 Black bean soup is a more recent recipe. For a long time I didn’t think I would like black beans. I have found they work great in a lot of the same dishes that usually use my beloved pinto beans. Heat oil over medium heat in a 4 quart stock pot. Cook the onion and garlic until softened and fragrant. Add the black beans and broth. Bring to a boil. Cover the pot and reduce to a simmer. Cook for about an hour. Taste soup for seasonings and add salt and pepper as needed. Puree the soup using an immersion blender or mash with a potato masher. Mix in the can of tomatoes and green chiles.